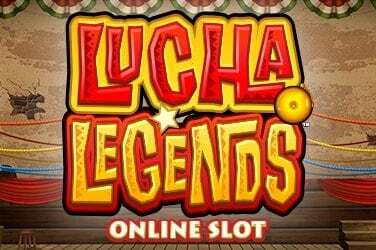 Microgaming continues its strategy of releasing online slots in partnership with other smaller independent studios with its Fortunium slot. 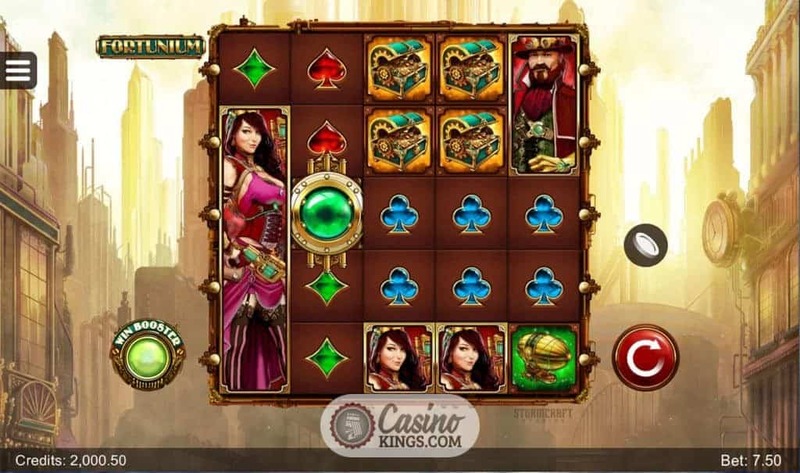 A five reel, five row, 40 payline steampunk slot. 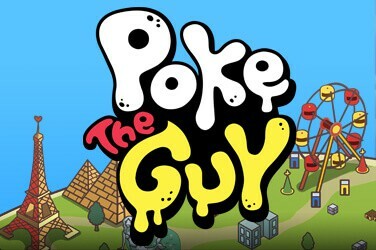 Created by the Stormcraft Studios development label. 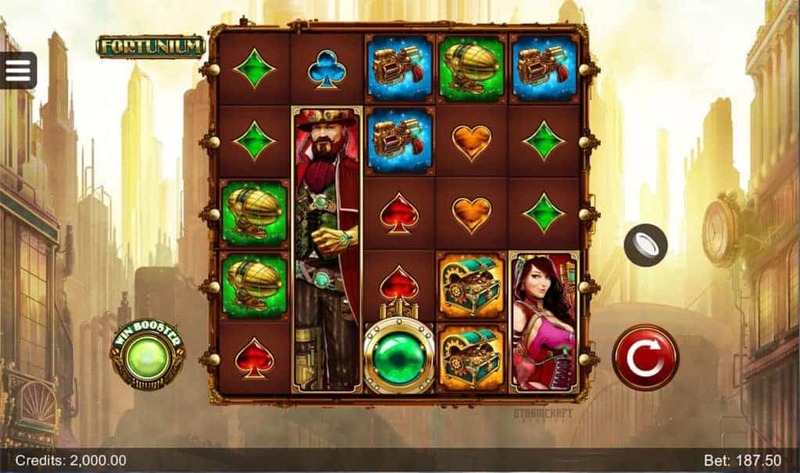 Fortunium sees us chase down wins aided by stacked and double stacked symbols, a Free Spins feature, Mystery Symbols and a Win Booster™. Just like the steampunk genre, Fortunium is wild, it’s creative and its breathless. The Fortunium that we seek can lead to bounties of 100,000, not to be sniffed at for any would-be steampunk hero. Our two main protagonists in this tale are Victoria and Maximillian, stacked five symbols high and adorned in full steampunk regalia. The Mystery Symbols are also super stacked, decorated with question marks and transforming into any other game symbols when they land. All our other high and low symbols appear double stacked, which means that we can still enjoy decent enough winning combos from them. 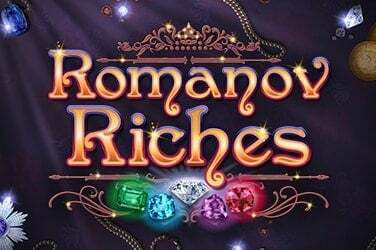 Our low-payers take shape in Hearts, Diamonds, Clubs and Spades, while a Gun, Airship and Treasure Chest form the bridge between the low-payers and the high-paying heroes. An airship Steering Wheel is our Wild, substituting for all other symbols except Scatters. A retro-futuristic cityscape stretches out behind our reels (it could be Fritz Lang’s Metropolis) while our gameplay is accompanied by an intriguing twinkling soundtrack. At any point we can activate the Win Booster™ feature by clicking a shiny green button to the left of our reels that echoes the Porthole Scatter. This boosts the amount of mystery symbols on the reels, but costs an extra 50% of our total bet. This is an optional extra, but surely the more options the better? 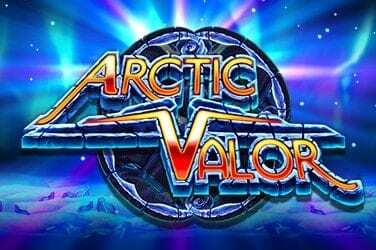 The Fortunium slot’s main bonus feature comes in the form of a Free Spins game, activated when we land three or more Porthole Scatters. 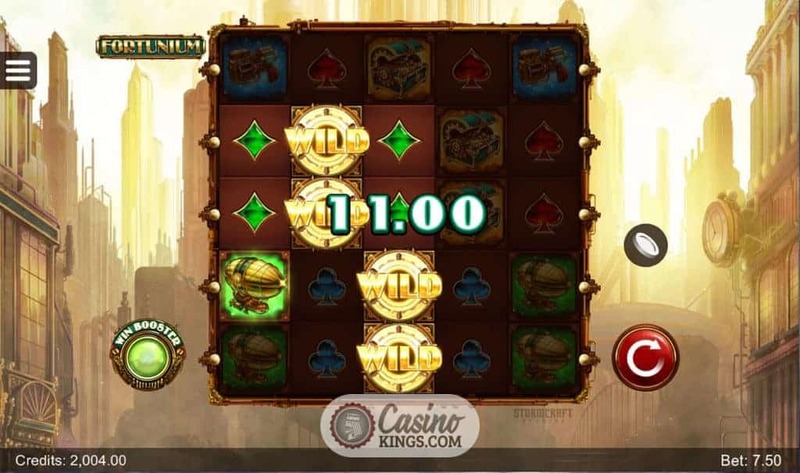 Not only do we earn Scatter wins that start of at the cost of our total bet, but we now also enjoy 10 free spins with Mystery Reels™ on reels 2, 3 and 4. How many Mystery Reels we enjoy is dependent on the number of triggering Scatters. The more Scatters we land to activate the game, the more Mystery Reels™ we can look forward to in the feature. 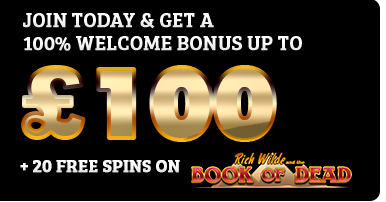 Every Scatter we land during the bonus round adds an additional free spin to out total. Bonus. 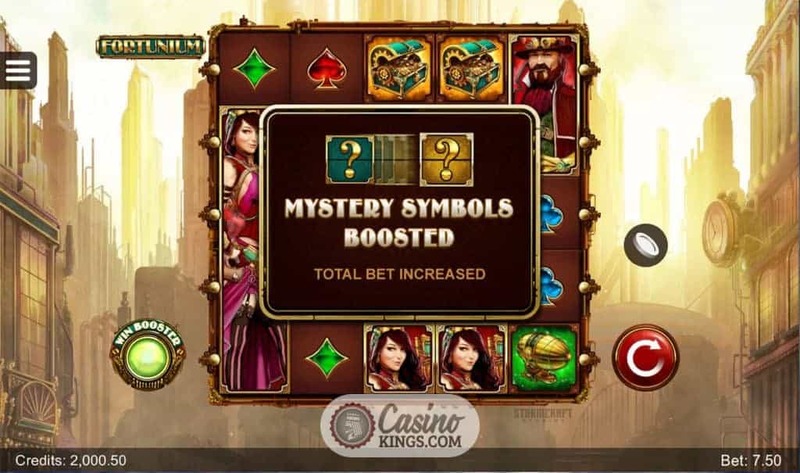 The Mystery Symbols and Free Spins Mystery Reels™ add a level of mystery that is key to any good steampunk story. 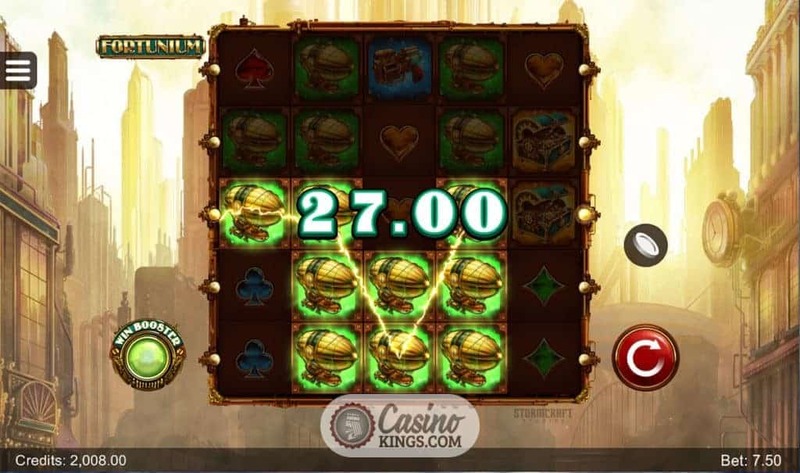 Should we trigger the bonus feature with five Scatters, we could be looking at multi-stacked winning combos across the game’s 40 paylines and the seriously lucrative rewards that would come with them. With a 100,000 jackpot on offer, it’s no wonder Maximillian and Victoria are risking life and limb to bring home the bacon. 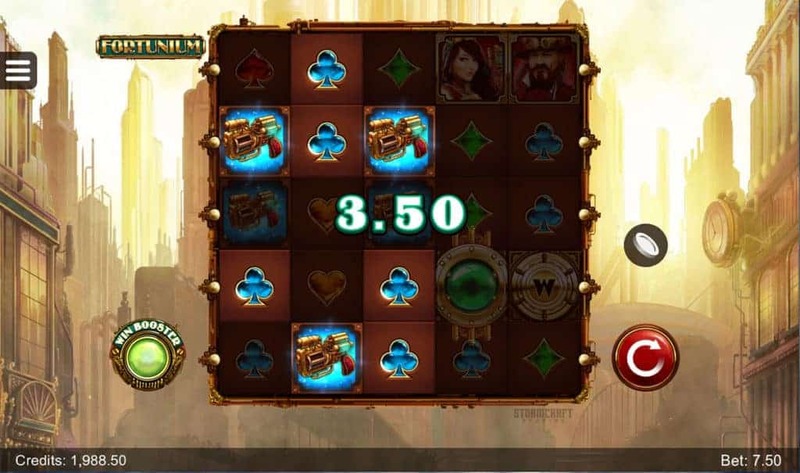 With steampunk slots like Fortunium, what more adventure do we need?